Pupil of Picot. After he won a price in 1844 he decided to pursue a painting career. Picot recommended him for the École des Beaux-Arts and he was admitted there on April 8, 1846. In 1849 he was admitted to the Prix de Rome competition, but Boulanger won. In 1850 he participated again, but this time Paul Badry won. Since there was a vacant place at the Villa Medici another Premier Grand Prix was unexpectedly awarded to Bouguereau for his painting "Zénobie retrouvée pas les bergers sur les bords de l'Araxe". He left for Italy in December 1850 and visited many cities before he returned to France in 1854. In 1856 he was asked to make a painting of Napoleon III and this resulted in "Napoléon III visitant les inondés de Tarascon", exhibited at the Salon of 1859. In 1862 he sold another painting to Napoleon III, in 1869 he bought a Rubens and a Van Dyck himself. Bouguereau was elected a member of the Académie des Beaux-Arts in 1876 and in the same year he visited king William III in the Netherlands. In 1881 he was made a Chevalier de l'Ordre de Léopold by the king of Belgium (in 1895 he was made a Commandeur). In 1903 he became Grand Officier de Légion d'Honneur. Work: "Les Danse" (1850, Musée d'Orsay, Paris); "Les Printemps" (1866, Joslyn art Museum, Omaha); "La naissance de Venus" (1879, Musée d'Orsay, Paris). 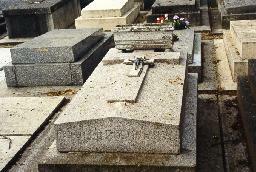 The grave of Bouguereau at Montparnasse Cimetière, Paris.